If you read my last few posts about DIY LED lamps built using 150W warm white LED cobs (which do not require an independent driver) you might have been excited by some of my claims. I previously stated that you could probably get around a 1000W HPS equivalent using just two of these lamps, which meant an energy saving of around 60% relative to the HPS equivalent. However to really verify these claims I wanted to get new PAR and lux meters to perform proper PAR and lux measurements. The results my friends, are disappointing. Previously I thought that these lamps were close to half of an HPS equivalent based on initial lux measurements. At the same distances, directly below the lamp, I could get around half the lux equivalent of your average HPS lamp, I thought from the warmer spectra of these white warm cobs that the PAR contribution would be significantly higher than that of a regular HPS but it seems that - due to the inefficient use of a white phosphor to produce the spectra - basically the PAR efficiency is equal to that of an HPS lamp. The PAR (Photo-synthetically Active Radiation) basically measures the number of photons that can be used in photosynthesis that you get per square meter per second off a given light source. I will write a more in-depth post about PAR in the future, but it basically tells you the plant-usable photon flux you get. It is therefore measured in umol*s-1*m-2. I performed classic PAR measurements with a 150W lamp 15 inches above a target center with measuring points around a 4 square feet area (to compare with the variety of HPS measurements you can find here). 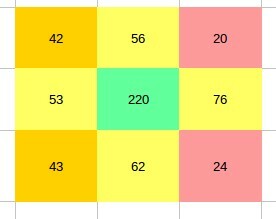 The results, in the first image in this post, show you the map of PAR values across the 2 feet by 2 feet area. This shows that the lamp is basically giving you 1466 umol*s-1*m-2 per 1000W at its highest point, which is below the PAR/watt of even the poorest HPS models. With this lamp model using 150W cobs you will therefore need at least 7 lamps to reach the same equivalent of a 1000W HPS in terms of actual photo-synthetically active radiation. Not only that but without any focusing or dispersing elements the PAR decay as a function of light distance is much more dramatic than for regular, reflector mounted HPS lights. With all these information it now seems clear that these warm white light LED cobs are NOT a good HPS replacement. However the idea of the zip tie lamp is not dead! I found out that there are actually "full spectrum" LED cobs that are specifically designed to be grow lights (so basically a combinations of red and blue LED lights). These cobs come in 20, 30 and 50W formats and they should have a much more favorable PAR than the 150W warm white LED cobs. I have now ordered some of these cobs (here) to rebuild my zip tie lamp and see if I can indeed get a much better PAR/watt and watt/dollar compared with normal HPS lights. Hello Dr. Fernandez, I've always been dubious about the efficiency of white LED's as a full spectrum grow light. I never carried out any exhaustive tests, but I feel vindicated to see you're results none the less. 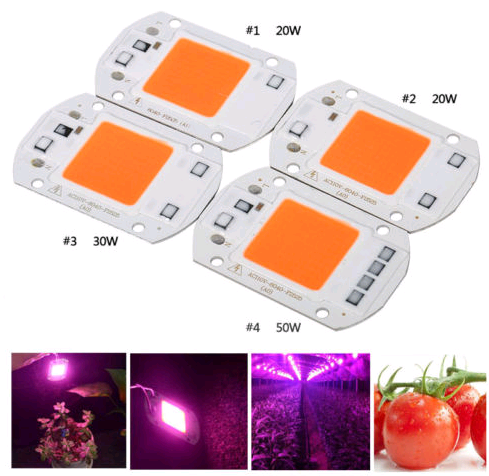 It seems that the use of white LED's is actually growing among grow light manufacturers in the last few years which has surprised me since I've always understood that LED's efficiency in regards to growing plants came from their ability to target peaks in the absorption spectra related to chlorophyll A & B, and possibly even carotenoids and xanthophylls . Despite what most people think green light does in fact contribute to photosynthesis and is valuable since it penetrates layers of the leaf tissue that red and blue light does not. Accessory pigments such as lycopene, beta-carotene and zeaxanthin have absorption spectra peaks in green wavelengths. Would you consider adding a small amount of green wavelength LED's to a non-control group for your next test to help me put this to rest? I'm glad you're back to writing blog posts after your hiatus, always a great read -James C. H.
Thanks for writing James. I am glad you found the results/post interesting! About using green leds, the issue is mainly that my goal is to have lamps that are cheap/easy to build, which means I have to use cobs that do not require an independent driver. These "full spectrum" grow cobs - the ones I will be testing - contain only a mixture of blue and red LED lights as far as I can tell, although if you find one with green diodes do let me know! Appreciate your science based thoughts! One can optimize 'green light spectra' , by dosing red/far red/ blue/ white ratios , and timing combined with nutrient regimens. Thanks Dr. Fernandez, please also publish the results of your updated full spectrum LED cobs. Thanks for writing Remo, certainly! I'll run the tests and publish the results once I get the cobs! Just ran across your blog and love it! Ive been buying random full spectrum leds with IC recently but have not been testing at all. Would you mind sharing tools or techniques recommended for measuring light? I bought a mini light meter equipped with photoelectric sensing technology that measures lumens which i can convert to PAR but i was told those meters are not accurate on LED full spectrum lights. ( not sure if this is true or not) I get the "15 inches above a target center with measuring points around a 4 square feet area" part Just wondering what device used to measure par? any cheap arduino sensors for that? Cheers! Thanks for the link! I will review his work and possibly write a post about it later on if I find it interesting. However it's important to bear in mind that the objective of my lamp building project is not to just create an LED lamp that has a better efficiency than HPS - that can be done and has been done many times - but instead to create a very CHEAP lamp that does NOT require an independent driver that can beat HPS. In other words, I don't just want to beat HPS in terms of PAR/watt but I also want something dirt cheap and EASY to assemble and use. I love your write ups, have you had a chance to run testing on the grow spectrum COB lights? Hi Dr. Daniel, iv been led to your blog a few times now via google searching and would like to say thanks for the effort you put into it. I first found it when searching about arduino stuff. Anyways....... iv grown indoors for years now iv used led in the past myself and didnt like it that much. It was a chinese panel though. The issue i have with led is that it doesnt have the canopy penetrstion that hps does. Also leds can degrade and 'pop' reducing its efficancy. Since they are smd there not as easy to replace than standerd hps. decent led panels and drivers also cost alot of money. Although i think that when led tech advances good leds will will be affordable and favorable due to its wide range of spectrum.